We’re a little late in getting this recommendation out there but we assure you, spontaneity will be in your best interest tonight. And if you’re on board with spontaneity, why not add “unexpected” to the mix. 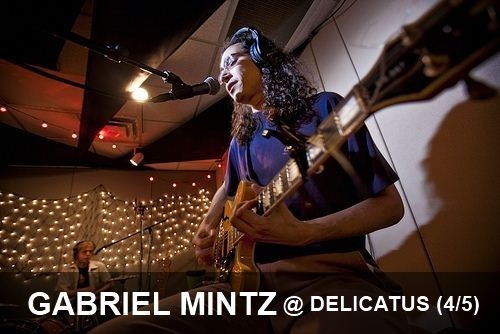 Longtime SEA live MUSIC favorite Gabriel Mintz will be playing a low-key set at an unexpected venue, Delicatus – the lauded downtown deli – starting at 6:30 p.m. Gabe tells us that he’ll being playing for an hour or more and the evening may or may not feature a drop-in or two from some of his immensely talented friends. Gabe plays Americana-tinged rock with hypnotic riffs, on which he adds his soft, unwavering vocals that are just raw enough to sell the whole thing. Be sure to get there early to grab a sandwich or two and a couple brews. Before you head to the downtown deli, be sure to check out Gabe’s KEXP session from a couple years back.